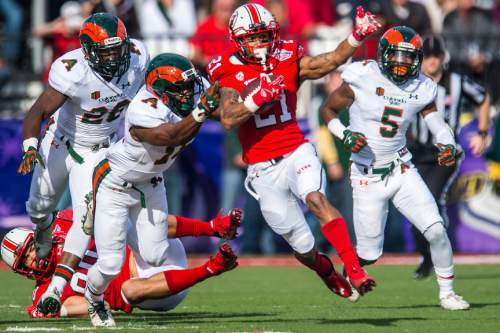 Chris Detrick | The Salt Lake Tribune Utah Utes running back Troy McCormick (21) runs past Colorado State Rams safety Trent Matthews (16) and Colorado State Rams defensive back Tyree Simmons (5) during the Royal Purple Las Vegas Bowl at Sam Boyd Stadium Saturday December 20, 2014. Utah is winning the game 24-10 at halftime. Chris Detrick | The Salt Lake Tribune Utah Utes running back Troy McCormick (21) is tackled by Colorado State Rams defensive back Preston Hodges (24) during the Royal Purple Las Vegas Bowl at Sam Boyd Stadium Saturday December 20, 2014. Utah is winning the game 24-10 at halftime. Chris Detrick | The Salt Lake Tribune Utah Utes running back Troy McCormick (21) runs the ball during the second half of the game at Rice-Eccles stadium Thursday August 28, 2014. Utah defeated Idaho State 56-14. Scott Sommerdorf | The Salt Lake Tribune Utah RB Troy McCormick breaks through the line during Utah football practice with pads on the baseball field, Thursday, August 7, 2014. As the lone back, spelling Devontae Booker. Sharing the backfield with Booker. Lined up as a slot receiver. The Katy, Texas, native was beginning to seem like a good bet to become one of Utah&apos;s top playmakers in 2015, and the timing of his emergence made it especially hard to watch Friday as he lay on the turf in obvious despair. After practice, Whittingham said McCormick likely sustained a "pretty severe" knee injury when he was hit squarely by sophomore Andre Godfrey  a hard tackle, but a clean one  and that he will likely "be on the shelf for quite a while." "That&apos;s the most unfortunate part of the game," Whittingham said. "... He&apos;s just a great kid, and it tears your heart out to see that happen." While Booker trotted off after practice, Whittingham grabbed him and told him "Troy&apos;s going to need your support, all your support." "I&apos;m going to see him right now," Booker said. McCormick was used sparingly while Booker amassed 1,818 total yards in 2014, but he totaled 86 yards on just five carries in Utah&apos;s Las Vegas Bowl win, including a 49-yard gallop. 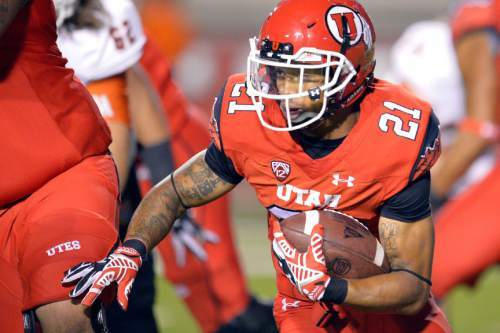 Like McCormick, senior running back Bubba Poole had been learning the nuances of slot receiver as Utah tries to get the most from its most dynamic players  the two had studied film together and had been staying after practice for extra work. Poole said he knows what will hurt most for McCormick is the expectation that this was going to be his year. "To see that, especially for him, that was disheartening." Running backs coach Dennis Erickson said Poole may play more running back, at least during spring. Redshirt freshman Tani Leha&apos;uli also played "pretty darn good" Friday, Erickson said, and he expects incoming junior college rusher Joseph Williams to be ready for action when he arrives in fall. "We&apos;ve got a couple other options on our team we probably need to look at, and we&apos;ll look at them Monday and see what we need to do." Hansen stands out • Junior Travis Wilson played mostly mistake-free against the No. 1 defense  or something close to it (more on that later)  but former Lone Peak standout Chase Hansen stole the show at Friday&apos;s full-contact practice. "He&apos;s definitely picking up things really well for a kid who hasn&apos;t played football in two years," said Wilson, took a little time to find his rhythm. Hansen  albeit against the No. 2 defense  was potent out of the gates. Alternating keepers and handoffs to Leha&apos;uli, the redshirt freshman drove the Utes downfield on his first series, capped by an end-around score from Poole. Later, Hansen shed a would-be tackler in the backfield (we should get used to that, it would seem) and fired on the run to hit senior Evan Moeai on the sidelines for a first down, followed by a lofted pass to a wide-open Poole in the left corner of the end zone. "It looked like he had a very good day," said Whittingham, who Thursday said that Hansen had moved ahead of sophomores Conner Manning and Brandon Cox. Hansen and Travis Wilson "seem to be separating themselves from the pack," he said again Friday. Manning was third up and had one notable highlight  a pinpoint sideline pass to sophomore Chase Loftin for a 30-plus-yard touchdown  and one notable lowlight  a gift-wrapped interception to sophomore safety Evan Eggiman. Cox and redshirt freshman Donovan Isom both were able to move the chains with their legs but had little success through the air in their limited opportunities. Odds and ends • Sophomore linebacker Sunia Tauteoli wore pads and took live reps Friday, his second practice back after a hamstring kept him out the start of spring, and "he&apos;s showing some good things," Whittingham said. "We see a lot of upside." 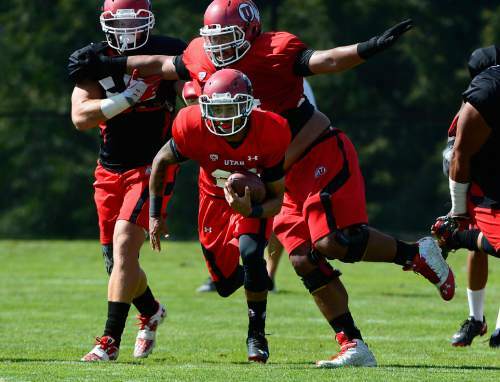 ... Utah took a look at junior Sam Tevi and redshirt freshman Jackson Barton at left tackle Friday, Whittingham said, to assess their ability to play there down the road. Tevi and Barton are officially competing for the right tackle spot while junior J.J. Dielman  a right tackle last year  holds down the left spot. ... Senior Tevin Carter appeared to play with the "twos" on Friday, but that&apos;s meaningless, according to safeties coach Morgan Scalley. 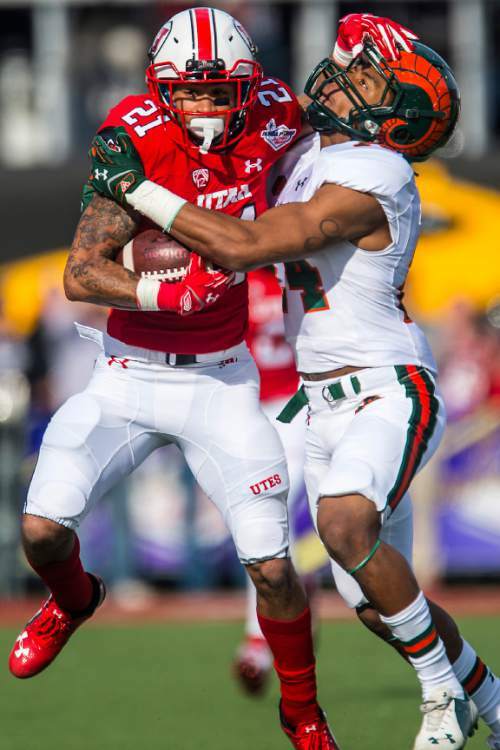 It was simply more important to Scalley that Godfrey and sophomore Marcus Williams get experience against Utah&apos;s No. 1 offense. • Williams, blitzing off the edge, showed off the leaping ability that made him a high school high-jumper in batting down a quick Wilson pass. • Junior Reggie Porter read Wilson&apos;s third-down pass to sophomore wideout Kenric Young and unloaded on Young, causing an incompletion. • Junior defensive end Pita Taumoepenu was a half-second late for a sack on Cox, but his pressure forced Cox to throw into tight coverage from sophomore Boobie Hobbs for a near interception at the goal line. • Junior Hunter Dimick, whose bull rush made life difficult for Wilson, emphatically batted down another Wilson pass. • Young leaped to grab Wilson&apos;s sideline pass over tight coverage from junior Dominique Hatfield  perhaps Young&apos;s only equal in volume of good-natured ribbing. Kyle Goon contributed to this report.